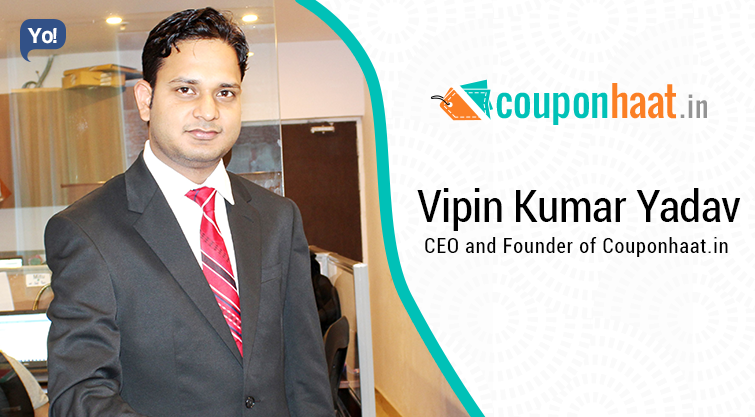 Vipin is an enterprising person with a knack of developing consumer friendly solutions. He has an expertise in several programming languages including visual basic and C#. He has a BCA in computer sciences and has done his masters in the same field. He started his career as a software engineer at AVL and soon went up the ranks. Soon he realized the scope of ecommerce in India and launched his own startup Couponhaat.in. Its mission is to provide the best coupons and deals for online shoppers in India. Within a span of short time, it has managed to make a name for itself and has garnered immense popularity. Couponhaat.in an online platform to offer the online coupons and deals. Coupnhaat’s main focus is to offer benefits to its users by providing them irresistibly economical deals &amp; coupons – they also offer enticing freebies, and giveaways. Couponhaat regularly updates promo codes, coupons and deals of various brands, which help both buyers and the brands. By providing customers the perfect coupons and deals, Couponhaat not only saves money but also reduces shopping time of online shoppers significantly. It provides buyers the best deals available across all the leading shopping portals. Just within a year, it has been able to witness a healthy growth and now has a team of more than 20. From my childhood days, I was keen to become an entrepreneur. It always dreamed of being successful and having a great story to tell my grandchildren one day and also I wanted be become my own boss. These were the things which motivated me to start something my own. After working for an MNC for few years, I decided to step into the world of entrepreneurship. I have been very passionate about exploring new things, particularly which can value add to people in their day to day life. One day, while I was buying few products online for myself, I somehow realized that there is a business scope in the online coupons and deals. After initial research, it came to my realization that this is an opportunity which should not be missed. And Couponhaat was born in my small rented room. I built up initial version, showed it to some of the friends and they liked it. My life mantra is that you are never late to start anything. Don’t think about the result, just start doing from today. Take Risk and Go for your dreams. In any business, challenges are part and parcel of the journey and are a part of daily affairs. Irrespective of the size of the business, challenges can’t be ignored at any point in time. Initially I faced difficulties to find right co-founders. It is very necessary that your co-founders having the same passion as you have. However, I managed to have great core team. Subsequently, we had to devote a lot of time and energy to select our team members and making them acquainted with our work culture. I think once you build good team members, other big challenges are surmountable. Other major challenge we faced is capital. We have invested from our own pocket into this venture. Without capital, we can’t move ahead, even if we have fantastic ideas, expertise and experienced team. We are looking to raise funds to make it to the next level. We are eyeing to raise funds and open for talks with VCs and Angel Investors. To find the right co-founders, I asked to some of my friends and they connected me to their friends and I had few meetings, understand the plans and vision and looked at the landscape and started developing first “real” version of Couponhaat. To build a great team, I had to invest a lot of time to find the right talent and interviewing for weeks and then provide training to new team members. To solve the capital problem, we have invested our own money and also started to develop software’s for one foreign client and this money we have invested into it. Currently we are investing from our own pocket but for fast growth. We are eyeing to raise funds and open for talks with VCs and Angel Investors. We have a very friendly and positive work environment. Team is very young and motivated. We do lots of fun and having flexible work environment. Everyone is free to give the feedback, and we have open communication culture and learning scope is huge as we are startup so you have lots of opportunities to show your talents in different fields too. We are using lots of online tools for project management and team management. I would like to recommend some of the great tools like Dapulse (Project management tool), Slack (Communication Tool), and Trello(Task management). The passion of becoming number one in my all games and ability to never stop leaning. I want to change my habit of late night sleeping. I really want to go to bed maximum 11 PM but it always 2 AM or more. Believe in yourself and follow your passion. We are coming up with lot many things in the near future. We’ll keep on announcing those initiatives from time to time. At the same time, we are working towards creating a solid team to scale up our operations optimally. We are already working on this aspect, which we believe is the main factor that would provide an edge over other players in the industry in the coming months. Also we are planning to go global. We are also working on more personalized user experience on our website and App both. I would not do it differently. I am very much satisfied with my career. I have no regrets for anything in my professional career how I build it and started my journey of entrepreneurship.